Delhi, February 18th, 2016: Volvo XC90, the Swedish car company’s flagship model has been awarded as the ‘Luxury SUV of the year’ at 2016 GaadiWaadi Reader's Choice Award. The awards were decided by the reader’s votes. 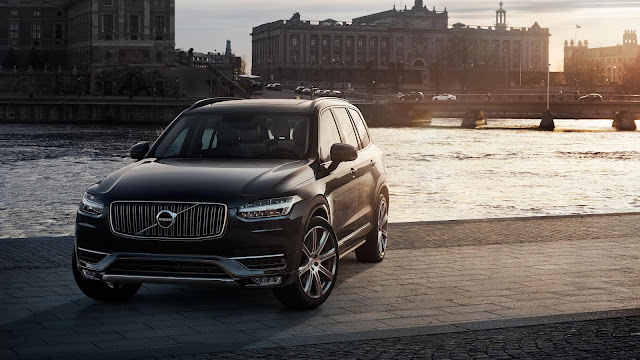 The all-new Volvo XC90 is delivering on its promise to introduce a visually striking Scandinavian Design, luxurious seven-seat SUV with world leading safety features, new power-train technologies, an unrivaled combination of power and fuel efficiency. Volvo XC90 is available in D5 Inscription and Momentum trims, 2.0L 4Cylinder, automatic8-Speed AWD with 225HP and a whopping 470Nm torque. The XC90’s interior is the most luxurious to have been designed for a Volvo. One of the most striking feature is a tablet-like touch screen control console, which forms the heart of an all-new in-car ‘Sensus’ This system is virtually button free and represents an entirely new way for drivers to control their car. The XC90 features one of the top audio systems available in the automotive world after Volvo Cars audio experts joined forces with their counterparts at the renowned British audio equipment company Bowers & Wilkins. The top-of-the-line system in the XC90 features a 1,400 Watt Class D amplifier and 19 Bowers & Wilkins speakers. The XC90 comes standard with Air-Suspension to tackle the diversity of Indian road conditions, enveloping its occupants in sublime comfort. Among other World-Class safety features, the XC90 comes with a World-First Run-off-Road Protection system. No wonder it has been adjudged as ‘Top Safety Pick’ for 2015 by the Euro NCAP. Swedish luxury car company Volvo Auto India (VAI) established its presence in India in 2007 and has since then, worked intensively to market the Swedish brand in this country. Volvo Cars currently markets products through its dealerships in South Delhi, West Delhi, Gurgaon, Ahmedabad, Surat, Mumbai, Chandigarh, Coimbatore, Hyderabad, Chennai, Bangalore, Kochi, Vishakhapatnam, Pune and Kolkata. The company sells six luxury models.